This exceptional blended Scotch whisky has been created for us by Richard Patterson, Scotland’s only third generation Master Blender. The backbone of this whisky is Invergordon grain whisky, acknowledged as one of the highest quality and lightest grain whiskies in Scotland, which has been aged in fresh oak barrels for five years and above. This is complemented by five first class single malts-three from Speyside, one from the Highlands and one from Islay. What makes Pig’s Nose Different? Nose: Firm and rich luscious creamy, round tones. The long marrying period has brought these many individual characters into one lasting union. Great harmony – soft and full with no ragged edges, smooth and mellow. Plenty of finesse and breeding. Taste: A positive grip, almost a spicy richness as these great flavors attack the palate – leaving it beautifully rewarded as they drift over. Elegant and distinguished. The delicate Speyside Malts – the heart of the whisky- have played a major part in bringing this quality blend together. Soft and sweet on the nose with notes of custard, cinnamon, smoke, and peach pure. Beautifully textured with caramelized nuts, cherry, bacon fat, and the slightest suggestion of peat, this is a smooth, and sippable whisky. "So named for texture is as soft and smooth as a pigs nose, this five-year-old whisky has a bright golden tint and mild notes that balance fruit and sweet vanilla. Add a splash of water to bring out light smokiness and still more vanilla." "The great news is, it is possible to find great Scotch for a steal, and it will still taste as interesting and complex as some of the more prestigious brands... Pig's Nose stands out on the shelves thanks to its bold label design, but the copper-colored liquor also stood out against other brands as a friendly option for those new to Scotch. It's relatively young, clocking in at a tender five years, so it has a somewhat thin body. Peaty smoke also takes a backseat to light cantaloupe-like fruit flavors and crunchy grains. When diluted, its slight edge mellows into a buttery texture, and thanks to its solid balance of smoke and malt, the "smooth as a Pig's Nose" Scotch plays great with other ingredients like vermouth in the Rob Roy cocktail. 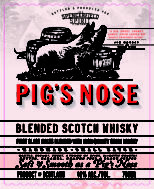 "Easier to pronounce and very easy to drink is Pig's Nose, a blended Scotch, floral and malty. The name stems from the contention that this whisky is as smooth as that bit of anatomy. Playful Pig's Nose, aged five years, is appropriately round and mellow." "Very smooth and mellow with toffee, sweet toasty oak and silky dried fruit; lovely and balanced with style, finesse and balance; charming and easy going." "Scotch can be an expensive habit. But thanks to the growing number of budget-minded bottles, an affinity for Scotland's namesake spirit needn't break the bank... blends like the cheekily named Pigs Nose mark affordable offerings from Scot1and's great master distillers." "The nose is filled with the scent of sweet tea biscuits with accents of honey, toasted grains, and roasted nuts. The palate is fresh and rich with gobs of sweet malt coating the tongue and throat. A beautiful everyday Whisky." "With standout packaging Sheep Dip has a deep, woody flavor; [Pig's Nose] is smooth, light, and lemony." "A soft aroma of sweetness and malt wit a little grassy hay. Earthiness, smoke, peat and sweetness are evident in the beginning of the flavor. There's a touch of salinity and spice. The finish is dry with a bit more smoke. Well liked."